A picture of a Lincolnshire murder victim's car has been released in an attempt to trace his movements in the days before his body was discovered. Alan Wood was found stabbed to death at his home in Lound on 24 October. He was last seen alive on 21 October and police are now urging anyone who saw the 50-year-old's car on the days in between to contact them. 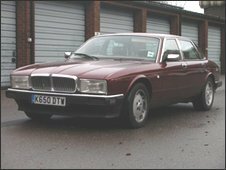 Detectives said the burgundy Jaguar Sovereign saloon, registration K650DTW may have stuck in people's minds. Police have been examining CCTV footage from cash machines in Stamford and Bourne after attempts were made to use Mr Wood's cash cards after his body was found. Cash was also withdrawn using the cards on October 22 and 23, possibly by the murderer, police said. Mr Wood's family have expressed shock that anyone would want to harm the "gentle man".